404 server / page not found : The most obvious solution to this common browser message is to check that you typed the web address correctly. If you did, there may be a problem with your internet connection or the site itself may be down. Also check that your firewall isn’t blocking your browser. 500 internal server error : If you only see this message on one website, then the problem is at the server end. If you see it on several sites, the error may be caused by a dodgy browser add-on or by a malware infection. Try disabling your add-ons and run a malware scan. 504 gateway timeout : This message usually relates to a network problem at the server end, which means it isn’t your fault. Try refreshing the page or revisiting the site later to see if the error has been fixed. 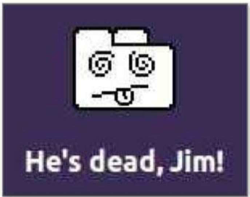 Aw, Snap!/He’s dead, Jim! : These amusing illustrated error messages in Chrome can usually be fixed by reloading the current page , or by closing the tab and reopening the page in a new one. You should also close any inactive tabs you have left open to free up memory.